For Ford engines, these can also be used on heads with guide plates. Magnum Roller Rocker Arms are the ultimate street rocker arms, helping your engine make more power and last longer. 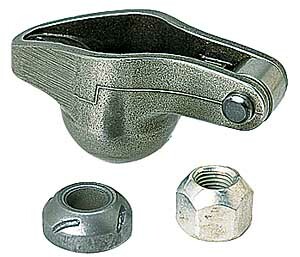 Made from 8620 chromemoly steel, Magnum Roller Rocker Arms are stronger than die cast aluminum or stamped steel rockers. Their stiffness guarantees maximum lift because the arms will not flex. When your car's rocker ratio is off, you won't get maximum horsepower from the engine. Some rockers are as much as .040'' short on lift while Magnum Roller Rockers are dead-on each time. Magnum Roller Rockers make between 15 and 30 horsepower over other rockers because, combined with their stiff design, the roller tips reduce friction, yielding more effective valve lift. The roller tip design reduces friction by not scrubbing the valve end or pushing the valve stem hard against the valve guide, which extends rocker life. Does COMP Cams 1442-16 fit your vehicle?